Photography. An art form invented in 1830s, becoming publicly recognised ten years later. Today, photography is the largest growing hobby in the world with the hardware alone creating a multi-billion dollar industry. Not everyone knows what Camera Obscura or even Shutter Speed is, nor have many heard of Henri Cartier-Bresson or even Annie Leibovitz. Today we take a step back and take a look at how this fascinating technique was created and developed, because proudly knowing the past is the primary way to create a great future. Before photography was created, people already knew the principles of how it eventually got to work. They could process the image on the wall or piece of paper, however no printing was possible at the time as preserving light turned out to be a lot harder task than projecting it. The instrument that people used for processing pictures was called the Camera Obscura (which is Latin for the Dark Room) and it was around for a few centuries before photography came along. It is believed that Camera Obscura was invented around 13-14th centuries, however there is a manuscript by an Arabian scholar Hassan ibn Hassan dated 10th century that describes the principles on which camera obscura works and on which analogue photography is based today. Camera Obscura is essentially a dark, closed space in the shape of a box with a hole on one side of it. The hole has to be small enough in proportion to the box to make the camera obscura work properly. The way it works is that due, to optical laws, the light coming through a tiny hole transforms and creates an image on the surface that it meets, i.e. the wall of the box. The image was mirrored and upside down, however, so basically everything that makes today's analogue camera's principles different to camera obscura ones are the mirrors and the film which is used to capture and preserve the image created by the light. Photography, the way it was developing, was always believed to be the killer of the fine art. However, it is believed that the photo principles were widely used by Renaissance artists like Leonardo, Michelangelo and others. In the mid 16th century, Giovanni Battista della Portacentury, an Italian scholar, wrote an essay on how to use camera obscura in aid of making the drawing process easier. He projected the image of people outside the camera obscura on the canvas inside of it (camera obscura was a rather big room in this case) and then drew over the image or tried to copy it. The method is quite similar to that which was used in the Retroscope drawing in the animation industry in early twentieth century. The process of using camera obscura looked very strange and frightening for the people at those times and the Giovanni Battista had to drop the idea after he was arrested and prosecuted on a charge of sorcery. This is a picture of camera obscura in action the way it was used back then. Even though only few of the Renaissance artists admitted they used camera obscura as an aid in drawing, it is believed most of them did. The reason for not openly admitting it was the fear of being charged of association with occultism or simply not wanting to admit something many artists called cheating. 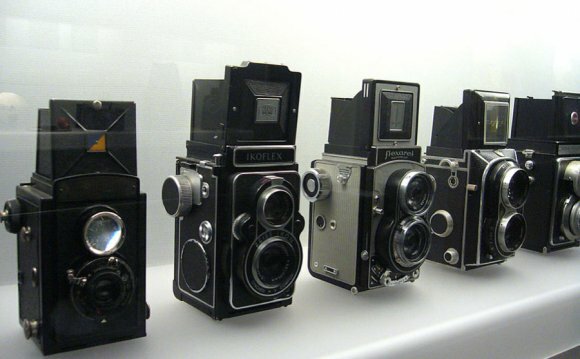 Today we can state that camera obscura was a prototype of the modern photo camera. Even though it seems useless today, many people still find it amusing and use it for artistic reasons or simply for fun. Installing film and permanently capturing an image was a logical progression. Due to the technical issues the exposure had to last for eight hours, so the sun in the picture had time to move from east to west, appearing to shine on both sides of the building in the picture. There is, of course, no composition as photography at the time could not be seen as art but rather as technical innovation. Like I have stated before, by that time people already knew how to project pictures, they just didn't know how to preserve and "save" light. Niepce came up with the idea of using a petroleum derivative called "Bitumen of Judea". Bitumen hardens with exposure to light so the unhardened material was then washed away. The metal plate, which was the media used by Niepce, was then polished rendering a negative image which then was coated with ink producing a print. One of the numerous problems with this method was that the metal plate was heavy, expensive to produce, and took a lot of time to polish. In 1839 Sir John Herschel came up with a way of making the first glass negative as opposed to metal. The same year he coined the term Photography deriving from the Greek "fos" meaning light and "grafo" - to write. Even though the process became easier and the result was better, it was still a long time until photography was publicly recognized. At first photography was either used as an aid in the work of an artist or followed the same principles the artists followed. The first publicly recognized portraits were usually portraits of either one person or family portraits to preserve the memories. Finally, after decades of refinements and improvements, the mass use of cameras began with Eastman's Kodak's camera. It went on to the market in 1888 with the slogan "You press the button, we do the rest". In 1901 the Kodak Brownie was introduced, becoming the first commercial camera in the market available for middle class. The camera took black and white shots only, but still was very popular due to its efficiency and ease of use. Color photography, despite being explored throughout the 19th century, did not become commercially valuable until the middle of the 20th century. The scientists in the beginning of the century could not preserve color for long enough, as they were lost with time passing due to their chemical formulae. Several methods of color photography were patented from 1862 onwards by two French inventors: Louis Ducos de Hauron and Charlec Cros Practical who, however, worked independently.